If this bird were in living color [as shown in the chapter newsletter - ed.] or on the screen in a slide show we wouldn't be having this conversation. One of the most strikingly patterned birds in North America, it is also one of the least well known. In this shades-of-gray rendition we are deprived of one of its beautiful colors just as we are, in most winters, deprived of its presence here in our state, and the reasons for the latter have yet to be satisfactorily understood. What we do have in our photo is a conical, seedeater bill and two outstanding plumage features, the most obvious of which is the black facial mask extending onto the chin. There are really only four winter visitors which would give us this look, and only one of these four would display the large white areas in the center of the inner tail retrices which show nicely in this ventral view. This could be a Black-capped Chickadee, white cheeks stained dark by foraging in a blueberry patch. For state listers, Black-capped Chickadee is a big tick, usually found only in winter in the Four Corners area or along the Utah border. Chickadees would not show this vertical posture nor this tail pattern, and the black cap would extend farther back onto the nape. If you're sure this is a chickadee, your blueberries are probably fermented. Two members of the sparrow tribe would certainly make good candidates, Black-chinned and Harris', the former a breeder in the mountain chaparral of central Arizona, the latter an occasional winter visitor from the taiga in northern Canada. Neither, however, would be this slim of body, and neither would have the white patches in the undertail. Black-chinned, in good light, will show no black above the bill. Harris' will show more extensive black on the upper breast. With this face and undertail combination our quiz bird, even without showing off its unique yellow breast, can only be a Lawrence's Goldfinch, an irruptive winter visitor in Arizona. The literature defines irruptive as irregular migration and, indeed, in a typical winter there are either many Lawrence's or none at all, and the ornithologists aren't sure why. This species is equally erratic on its known breeding grounds. Lawrence's is known for its love of bathing and is always found near water. Arizona's Lawrence's Goldfinches are probably Baja breeders searching, in irruptive years, for water. This photo was taken October, 1996 near the George West Waterfall below Proctor Road in lower Madera Canyon. The longer and wetter than average monsoon season which we have "enjoyed" this year indicates there will be no Lawrence's Goldfinches this winter. Once we realize the streaked sparrows are more conspicuously marked on the face and that Pine Siskins are daintier, slimmer birds with daintier, longer bills than our stocky quiz bird with its thick bill, we'll quickly find our way to the Carpodacus finch page. Now we need to slow down and do some homework. Purple, Cassin's, and House Finch can all be found in winter in our deserts, and the females can easily be mistaken for one another. Fortunately this photo gives us good views of all the key diagnostic areasóbill and tail shape, face and undertail pattern and breast streaking. 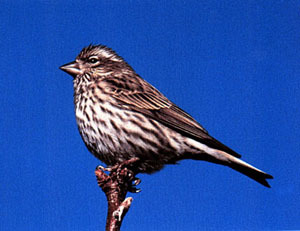 Of our three possibilities, House Finch has the shortest bill, Purple being intermediate, and Cassin's the longest. However, with nothing here for comparison length alone is not much help. What we do see on our quiz bird is a very straight culmen (upper mandible). Typically on the shorter-billed House and Purple Finches the culmen appears curved, so our first clue points to Cassin's. Both Purple and Cassin's look short-tailed, and their tails are deeply notched, so our second diagnostic, length and shape of tail, seems to help eliminate House Finch. Face pattern is often considered the defining characteristic for the female finches. Once again we can place typical birds on a continuum, House showing a very plain face, Cassin's some detail, and Purple quite obvious patterning. Our quiz bird certainly shows a distinct pattern, which eliminates House Finch, but is it strong enough to be a Purple? Female Purple Finches typically show a very obvious dark ear patch strongly outlined by white supercilium and cheek stripe, the latter made more conspicuous by a very obvious dark malar (originating at the base of the bill) stripe. It's all relative, isn't it? Our bird certainly has an obvious ear patch, but how strong are the eyebrow, cheek, and malar stripes? It depends on what your comparing with and the angle of light. Cassin's "usually" has a complete eyering, House and Purple "usually" do not. Our bird certainly has an eyering, but it's not complete. We seem to have eliminated House Finch, but where do we go from here? Next on our list was undertail coverts, and the clue we are looking for is streaking. House and Cassin's have it, Purple "usually" does not. Our quiz bird shows strong, obvious streaking in the vent area, so it is "probably" not a Purple Finch. "Probably" probably isn't good enough for any final identification. Let's consider breast patterns. Although our bird shows obvious heavy streaking, in black and white we don't have the advantage of background color. In House Finch this is a brownish-white, in Cassin's a clean white, in Purple an off-white, the upshot being Cassin's streaks will be more striking. We're seeing striking streaking, but what of the streaks themselves? Cassin's are described as long, narrow, and well defined, whereas Purple's are said to be short, broad, and somewhat washed out at the edges creating a spotted effect. Are you confused yet? This female Cassin's Finch was photographed December, 1989 at Seven Springs. The little exercise we have just wended through seems the perfect paradigm for dealing with problematical identifications. Don't rely on single features. Don't even rely on a couple characteristics if a whole set is available. Be patient. Go slowly. Once you force yourself to work through a checklist such as this a few times you'll be surprised how competent you become with new field marks. You may still be wrong, and some birds defy identification short of having them in hand. Accept these two possibilities. Don't worry. I will never run out of truly bad photos, but this one is bad only from a diagnostic standpoint. This is a close, sharp photo of a strikingly easy to identify bird from the worst possible diagnostic angle, especially dealt a hand with no color. And the most obvious plumage feature in our photo is one that is rarely noticed in the field because identification is so straightforward. If your eye isn't drawn immediately to this bird's gross beak, you've been into those blueberries again. This bill is so huge the bird appears foreheadless. Geography eliminates Hawfinch. The season eliminates Yellow Grosbeak. Bill color and size eliminate Blue and Pine Grosbeak. We're left with Black-headed, Rose-breasted, and Evening, and there are winter Arizona records for all three. Have you ever noticed a pale throat outlined by a black malar stripe on a grosbeak? I hadn't either until I really looked at this photo, which was weeks after I had taken it and identified the bird in the field by its large white wing patches and white undertail tips which are barely discernible here. This is a female Evening Grosbeak and it popped up in deciduous, all by itself, at the Northern Jacana site at Arivaca Lake, October, 1998. How often do we neglect to really scrutinize and study the female of a species with a beautifully plumaged and easily identifiable male? Doesn't happen in our own species does it? Here's your test. Close your fieldguide. Now write down a couple diagnostic features of a female Lawrence's Goldfinch. Not features that distinguish it from a male Lawrence's, but features that would identify it if you saw it by itself, without male or flock accompaniment. That's what I thought. I couldn't do it either.